First of all, I would like to welcome our new subscribers to the SomaNews community. Thank you for joining! I’m also excited to announce my new audio practices. Below you’ll find an audio presentation of the practice that has become a part of SomaNews. Those new to somatic practices will especially benefit from listening and following along. I would appreciate any feedback you’d like to provide. Summer is here and the warmth of the season sinks deeply into my life and I hope into yours. I started the summer at 6,500 feet in the desert of New Mexico at a powerful gathering for connecting with nature. My intention for this opportunity was to walk through my fears and not let them stop me from being the effective self-generative human being I want to be. No easy task, huh? When life gives you a challenge and stops you short in your tracks due to fear, lack of confidence or the unknown, do you get in your own way? For example, while in New Mexico I was asked to complete a task that in the beginning I thought would be something I could walk through my fear and complete. As the day wore on, my fear grew and my self-confidence dwindled. My world got very small. In other words, it became about me, and in doing that I lost connection with the bigger picture, which was to truly support the community there. You know that saying about “the world does revolve around me”? Well, when you are in fear or have lost confidence, that is where you go – the world becomes small and it becomes much harder to move forward. Your body can take on a different way of being. For me, my stomach tightens and my breath gets shallow. But when you can notice your body’s reaction, you can choose to connect with the bigger picture. This expanded connection gives you more energy, more choice and more possibilities to transform the moment to an opportunity instead of a challenge. Now take a deep breath and relax your shoulders and belly. Imagine your world moving out into concentric circles to something bigger than you – nature, the heavens, your family, your community – those structures that help support you by reaching out and helping to hold the weight that you have taken on. \In my June newsletter I announced a workshop for women at Saratoga Springs Retreat Center that I’m holding with Somatic Coach and Recreation Therapist Sandy Sagraves. 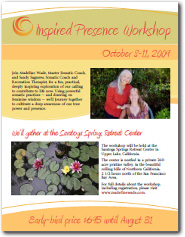 Please note that we’ve changed the date a week earlier to October 8-11, 2009. Join us for a fun, practical, deeply inspiring exploration of our calling to contribute to life now. Using powerful somatic practices – and drawing on feminine wisdom – we’ll journey together to cultivate a deep awareness of our true power and presence.